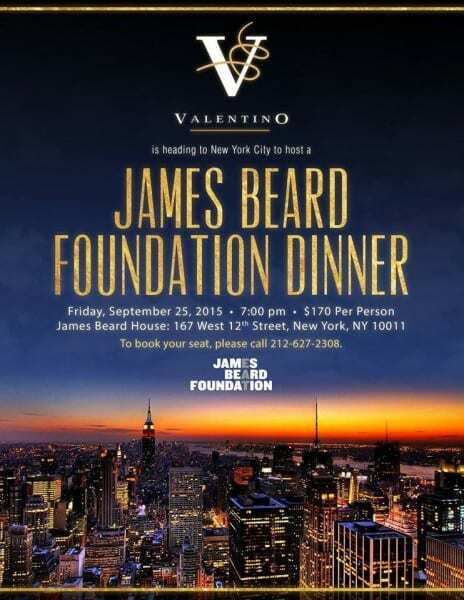 Join Valentino for a spectacular evening in New York City at the James Beard Foundation Dinner at The James Beard House on September 25th! Chef Giovanni Rocchio has been asked to craft a seven course tasting menu with a wine to complement the flavor profile of each course. Purchase your tickets for $170 per person. Reservations must be made in advance by going to http://www.jamesbeard.org/events or by calling 212-627-2308.